Early this morning I met my Partner in Crime, BumbleBee for a ride along the river Thames. Our meeting point was Trafalgar Square at 08:00 but being fashionably late the actual rendezvous was slightly later. It was quite a grey and cloudy start to the morning and it was a change from the last few days. As we set off their was little traffic and people around. We cycled along the Strand towards St Paul's Cathedral and then headed across the Millennium Bridge. This is an old haunt for my riding Partner and I but the views never cease to disappoint. As tourists took photographs, so did we. In fact some of them took photos of two people on brightly coloured Brompton bicycles too. When we reached a favourite view of Tower Bridge the small jets of water in the floor were in operation and we wasted little time in taking yet more photos. My riding Partner started to raise his hands up and down, as if to control the jets of water and resembled a Jedi. I have some video footage of this and I'll put it together at some point as it is priceless. Passing City Hall we aimed for Tower Bridge and once across we headed for St Katherine's Dock. At this time of day the traffic over the bridge was pretty light but a steady stream forced us to cross most of it on foot. At St Katherine's Dock we agin saw 'Gloriana.' This is Royal barge built to commentate Queen Elizabeth II for her Diamond Jubilee. If we are being vulgar Gloriana cost a considerable sum to build and took part in the Thames Diamond Jubilee Pageant. (Have a look on YouTube or similar for footage of this if interested). Shortly after this a few drops of rain started to fall so my trusty RX10 was put back in its case (despite being weather sealed) and didn't see the light of day again until I had returned home. By the time we reached Edwards Park where there are some stunning views of Canary Wharf the rain started to fall a little heavier. There are times when there is that distinct smell in the air that means it is going to pour down. Do you know the smell I mean or is it just me? Anyway, this smell was quite evident and and the amateur meteorologist in me was ready to predict a fairly detailed forecast for the next 40 minutes! With the rain a little heavier than I have mentioned above we donned our waterproof jackets and pressed on. Reaching Greenwich we went under the Thames via the foot tunnel and at the other side looked at each other and decided to call it a day. Heading for the Thames Clipper jetty, the sky became dark and the rain fell monsoon-like. Turning to each other we gave a knowing look and realised that we had made the right decision! The Thames Clipper journey was as always very enjoyable and before long we arrived at Embankment. 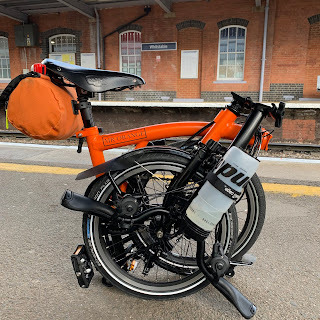 I needed to go to the Brooks saddle shop in Covent Garden in order to collect my 'Tweed Run' bits and pieces but before that we headed to Brompton Junction as I needed a new chain. As always it was great going on a little adventure with my Partner in crime and it seemed as if it had been ages since we had done so. My my way back I made a slight detour to have a look at Carlton Tavern in Carlton Vale. This was allegedly demolished with no warning and without permission. There really isn't much left of it and who knows what the outcome will be?